As you know it has been a very long time since I have added a photo assignment to Through the Lens: Digital Photography 101. It was never my intention to drop the ball with the group, but as you all know, sometimes circumstances take over and life has to take priority. Now that things are starting to normalize, it is my intention to pick up where I left off and continue with the assignments and challenges for those who are still interested. The next assignment will be on shutter speed; however, while I continue writing that, I will be adding a photo challenge or two, to practice the skills that we have already learned. Today’s challenge: take a photo, or many using - color. It could be your favorite color, many colors, unusual combinations and designs, bright, muted, colorful buildings, signs….it’s all up to your interpretation. Don’t forget to set your white balance. You want your colors to look accurate, without any funky color casts to throw them off. Check your composition. Take many shots at different angles, then decide which you like best. For this assignment we will use a wide aperture to create a shallow depth of field. Remember to watch your focal point and have your camera set to aperture priority, unless you are already using manual settings. In which case, go for it! Lastly, submit your photo by Friday, February 27th and come back here to link up to Mr. Linky once you have uploaded your finished assignment to your blog. You can also add your photos to our Flickr group. Interestingness – This is one of my FAVORITE sites for inspiration! 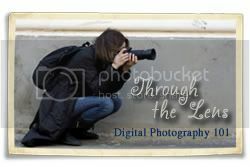 You can join here: ThroughTheLens-DigitalPhotography101-subscribe@yahoogroups.com. After clicking this link, just send an email expressing your desire to join the group, or a blank email is fine also. Glad you’re back up and at it…you are so talented and such a blessing. Hi! I saw your post of the Homeschool Lounge Photography Buff Broup and came to visit. What amazing images you take! I aspire to be as good as you one day! I will definitly be back often and would love to put your site on my blog list if that’s OK with you. Maybe when I get brave enough I will post to Mr. Linky, too! What kind of camera do you use? Thank you Sonya! I think you should get brave now! Practice makes perfect. I use a Canon 5D. Hallie! I’m so glad you’re back! I hope everything is going well. Meanwhile, I’m really excited to get to work on the color challenge! I’ll be back to link when I’ve completed my photo. I am soooooo excited! I love photography! Hi, I’m DaNella by the way. here’s my post since Mr Linky has disappeared. Sneaky little devil. Through the Lens Assignment: Color! Great challenge, Hallie. Thank you for hosting this group.